Though we’ll usually recommend hardwood flooring, there are occasions when choosing a laminate (Pergo) floor is ideal. A laminate floor mimics the look of hardwood, with each board topped with a realistic image of real wood flooring. To get the most realistic result, we recommend a laminate product with individual boards instead of the tiles picturing several boards at once. This allows for the randomized look of a real hardwood installation. Flooring is to be installed over concrete. You don’t need to nail laminate flooring to a sub floor, so houses built on slab or finished basements can be cause for choosing a laminate floor over hardwood. It is possible to have a “floating floor” with real wood installed over concrete (where the boards are glued together at the tongue and groove instead of nailed into the floor), but this is often a more expensive alternative. Scratch and Wear Resistant/Low Maintenance. This does not mean damage resistant (see Cons to Laminate below). However, daily wear and tear, moving light furniture, and other activities that may mar real hardwood are less likely to happen on a laminate floor. This might be ideal for investment property or for those with pets. Environment/Allergy Friendly. Many brands of laminate flooring require minimal manufacturing (low carbon footprint). In addition, since there will be no sanding and finish process needed, there isn’t exposure to dust or odors from sealer or finish products. Less Expensive. In most cases, you’ll save some upfront costs by choosing laminate flooring. There are hundreds of options to choose from, so don’t hesitate to ask our recommendations for the best product to fit your budget and your design preferences. Faster Project Window. 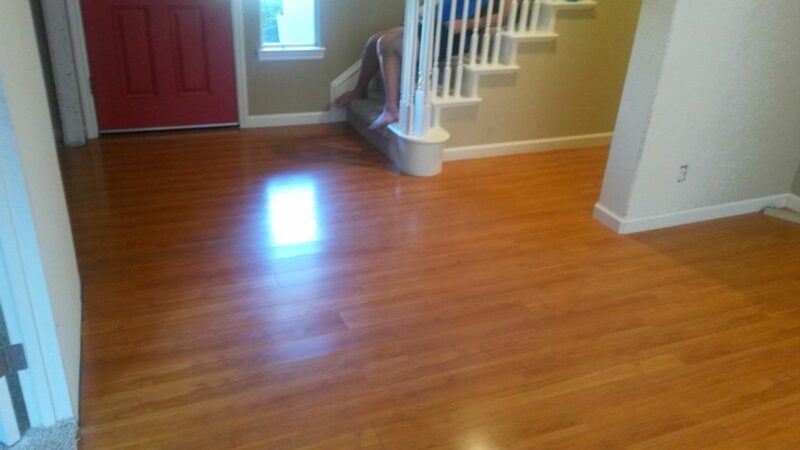 Again, since only installation is required, a laminate floor can generally take less time to install. If you only have a short time to get your floor done, such as during turnover for a rental property, then laminate may also be the ideal choice. It’s important to note that the most common downfalls to choosing laminate apply to long-term considerations. Balance these with your needs in comparison to the potential pros listed above to make the decision that’s best for you. Damages can’t be repaired. Unlike hardwood, where individual boards can be removed and replaced, laminate flooring is permanent as an entire unit. Pet urine and major water damage require the entire floor to be removed and replaced. For this reason we do not recommend installing laminate in kitchens, bathrooms, or laundry rooms. Cannot be customized. What you see is what you get. Laminate flooring cannot be cut into custom widths or other shapes to make borders or inlays. It also can’t be cut to size for vents in the floor. If you ever want to add-on to your laminate, most circumstances will require a fresh start for the new room with a threshold piece dividing the rooms. In other words, lacing in (not to mention finding a matching grain or lot) is rarely an option. No sanding or refinishing. Unlike real hardwood, you can’t sand off dings or surface damage, do a maintenance coat, or change the color with a custom stain. This is something to consider if you plan on selling your home (see #5). Won’t last forever. Eventually, a laminate floor will need to be replaced. Most come with a 30-year limited warranty. May decrease resale value of home, or prolong market time. As popular as hardwood is, a potential buyer may be turned off from a laminate floor for any of the above reasons. Especially in the case of high-end homes, spending the extra cash on real hardwood usually adds value to a home. Choosing laminate to get a quick sale for less up cost up front can end up backfiring depending on the home as a whole.